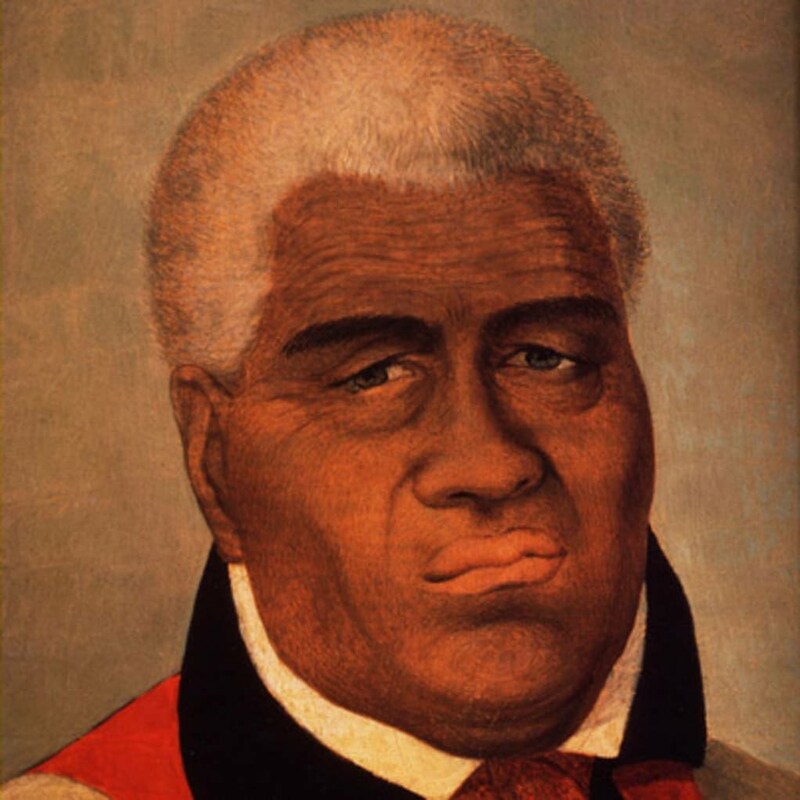 Kamehameha was born circa 1758 in Kohala, Hawaii. When King Kalaniopuu died in 1782, the island of Hawaii was divided between his son, Kiwala’o, and his nephew, Kamehameha. Kamehameha battled Kiwala’o and others for control of the island. He eventually succeeded and went on to take over most the majority of nearby territories as well. By 1810, Kamehameka had become ruler of all the Hawaiian islands. He died in 1819. King Kamehameha I was born into Hawaiian royalty. His mother, Kekuiapoiwa, was the daughter of a Kona chief. There were reportedly many prophetic signs that he would be a great leader, including being born around the time that Halley’s Comet lit up the Hawaiian night skies in 1758. Warring clans saw him as a potential threat, however, and he was hidden away for years to keep him safe. Kamehameha eventually returned to his family and began to train with his uncle King Kalani’opu’u, the ruler of the island of Hawaii. He proved himself to be a great warrior and was said to have been so strong that he could lift the 2.5-ton Naha Stone, a feat that, according to prophecy, indicated the man who would unite the Hawaiian Island. Kamehameha also accompanied his uncle to meet famed English explorer James Cook on his ship the Discovery and fought with him in the 1779 battle during which Cook was killed. When King Kalani’opu’u died in 1782, Kamehameha received an unusual inheritance. His uncle left him the island’s war god while giving his own son Kiwala’o control over the island. It wasn’t long before Kamehameha and Kiwala’o began battling over the island’s lands. But even after the death of Kiwala’o in July of that year, Kamehameha faced other foes on Hawaii. He eventually triumped, however, and took several wives, including Keopuolani, the daughter of Kiwala’o, and Ka’ahumanu, who became his favorite. After seizing power, Kamehameha found allies in such foreigners as Isaac Davis and John Young. In 1790, he attacked Maui with their help, and they served as his advisors for many years. Kamehameha soon used his relationships with traders to build up an armory of Western weapons, trading Hawaii’s much coveted sandalwood for arms. Over time, he and his army were able to use their superior firepower to take charge of most of the Hawaiian islands. The last holdout was Kauai’s leader Ka’umu’ali’i, but he eventually made a deal with him to avoid battle, and by 1810, Kamehameha became the first king to rule all the Hawaiian Islands. Kamehameha ruled until his death in 1819. During his reign, he governed following kapu, an ancient system of rules and laws. He also established new principles, including mamalahoe kanawai, or “law of the splintered paddle.” This law, which protected the defenseless as well as travelers, was inspired by an encounter with some fishermen. According to the story, Kamehameha was in a fight with the men when his foot got caught, and one fisherman stuck him with his paddle, splintering it in the process. Before the man could hit Kamehameha again, another fisherman successfully convinced the attacker to be merciful. An adapted version of the law became part of the Hawaiian state constitution in 1978. After his death, Kamehameha was succeeded by his son Liholiho who ruled as Kamehameha II. He died only five years later, and his brother Kauikeaouli took the throne as Kamehameha III.